Healthcare - How Do You Think? We’re Number 37! USA! USA! USA! I have little tolerance for unabashed patriotism. When you look closely at the facts with regard to important quality of life indicators, the good ole US of A falls short in many areas. Life, liberty, and pursuit of happiness and unalienable rights seem to apply more to corporate entities than they do to we the people. And freedom now has more to do with economic opportunity in other countries than it does with civil liberties for our own citizens. Don’t get me wrong, I am happy to be an American. Thanks to my brave and industrious parents and their forefathers, I have had a steady launching pad and subsequently have done moderately well for myself. However, I am very fortunate not to have been born Gay, a minority, or poor. To paraphrase an old Seinfeld episode “Not that there is anything wrong with being any of these,” but the reality is that these folks suffer at disproportionate levels in this country. And I suggest that this is a direct result of social and economic policies. Somehow, patriotism has become the exclusive domain of those on the Right who through Conservative policy support deregulation, free markets, hawkish military doctrines, government downsizing and subsequent cuts in social services and regulatory agencies. Even the Democrats have shifted to the right and this has been particularly true since the Clinton Administration. These policies certainly bolster corporate interests and the financial portfolios of the very wealthy. But those gains have come at the expense of the vast majority of Americans. The income divergence between wealthy Americans and the rest of us is no secret. Charts and graphs, easily accessible, have uniformly detailed the relative economic flat line that most of us have endured for decades while those in the top 1% show skyrocketing and seemingly geometric growth rates. Meanwhile, policies that may level the playing field for most Americans, have somehow been castigated as “Socialist” and “Anti-American.” This latter thinking is wrong on so many different levels. Regardless of the real world consequences, nearly half of Americans latch onto and support the Conservative – pro-business policies that are clearly at odds with their well being. One important way this plays out is in healthcare. 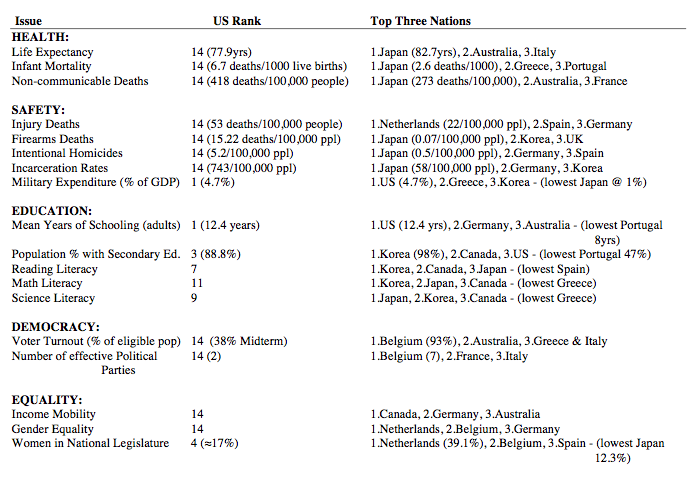 When it comes to life expectancy, the USA ranks number 37 in the world. That’s right 37! There are 36 nations that, as a people, take better care of each other than we do. In a recent study published in Population Health Metrics on life expectancy in the United States, data regarding life expectancies in every county from 2000 to 2007 shows how U.S. mortality compares with that from other wealthy nations. The results indicate that life expectancy in the United States has not kept pace with other nations. In fact, the data suggests that life expectancy has fallen in many counties, particularly in Appalachia and the deep south. Women in such settings have fared far worse than men. In 2007, life expectancy at birth for American men and women was 75.6 and 80.8 years, ranking 37th and 37th, respectively, in the world. Across US counties, life expectancy at birth ranged from 65.9 to 81.1 years for men and 73.5 to 86.0 years for women (Figure 1a). Geographically, the lowest life expectancies for both sexes were in counties in Appalachia and the Deep South, extending across northern Texas. Counties with the highest life expectancies tended to be in the northern Plains and along the Pacific coast and the Eastern Seaboard. In addition to these broad geographic patterns, there are more isolated counties with low life expectancies in a number of western counties with large Native American populations. Clusters of counties with high life expectancies for males and females are seen in Colorado, Minnesota, Utah, California, Washington, and Florida. What accounts for this gap and the lower relative ranking among our fellow longer living earthlings from other nation states? On June 16th, 2011, Melissa Block from NPR – Talk of the Nation discussed the results of this study with Dr. Ali Mokdad, a global health professor at the Institute for Health Metrics and Evaluation at the University of Washington. Dr. Mokdad noted that: “there are four factors – three are equally affecting men and women in this country.” He then indicated that the three equal opportunity factors included: (1) socioeconomic status; (2) access to healthcare/health insurance or no insurance; and (3) quality of medical care. In other words, if you’re poor, you don’t have medical insurance, and you live in remote areas with poor medical facilities, with less proficient professionals, you are more likely to die early. On the other side of the coin, it is true that we have the best quality medical care in the world, BUT, many Americans do not have access to this Tier 1 level of care. It’s only true for certain pockets of the population who are relatively affluent and living near major medical institutions. The fourth factor, preventable risk factors (e.g., smoking, obesity, poor diet, lack of physical activity), affects both genders but women and particularly poor women disproportionately. The study points out that in more than 300 counties in the United States, life expectancy declined over 20 years for women. It is time to wake up America! These statistics are appalling and embarrassing. Look at the the real world human costs of economic policies that create and sustain such divergence. The most recent recession, clearly the result of financial deregulation and unfettered free market greed, has had catastrophic global consequences that have reshaped the landscape. Budgetary discussions center around deep government cuts to education and social services – further compromising the very people who have been hurt the worst. Elimination of continued tax breaks to the richest Americans is absolutely off the table. And now the Conservative agenda is to abolish “Obama Care?” Look at the evidence people – its all around you. Before you buy into an ideology – look at the real world consequences – look at the evidence, and ask yourself how you and your loved-ones are affected. It scares me that such callus disregard for our fellow citizens is the new chic. Cancer, Aging, & Healthcare: America, We have a problem! I find myself in an unfortunate spot. Both my mother and father are suffering from seemingly intractable health problems and my wife was just diagnosed with breast cancer. My parents, each suffering for years with chronic pain have been victimized by aimless care in an over burdened, understaffed, and misguided healthcare system. The maladies of a healthcare system driven by economists has left us with a patient care system that is often just mediocre and sometimes atrocious. More evidence for this has played out in the sequence of events that has left cancer undiagnosed and unabated inside my wife’s breast for six months after she first detected a lump. What I have personally witnessed over the last year has left me appalled. There is not enough time, space, or reader interest, I suppose, to take you through these respective journeys. And my anecdotes, as deeply meaningful as they are to me, tell only a minute fraction of a complicated story. Multiple factors have coalesced to degrade healthcare, and these forces have been primarily dictated by the motive for profit, austerity, or the quest for financial viability. These interests have seemingly superseded the drive for quality care. When I had my own private practice (as a Licensed Psychologist) the reimbursement schedules set up by insurance companies provided financial incentives for care provision that were incompatible with my training and my personal and ethical care standards. Viability as a service provider demanded either compliance or unsustainable practices. In large part due to these realities I chose a different career path. This is all too common. Two of the best medical doctors I’ve known have left the field because of similar issues. When you can’t do what’s right and you feel like you have to thin your care to stay in business, the whole patient care scenario becomes compromised. Medical care for run of the mill ailments seems adequate (if you are fortunate enough to have health insurance); however, when issues are complex or they involve multiple body systems, the quality of care seems to break down. My father, for instance has many health issues. His care, when any of these issues becomes acute, pits one specialist against another and thus one body system against another. Just recently his acute pulmonary difficulties landed him in the ER and there, the care, as prescribed by an ER Doc, resulted in an adverse reaction necessitating yet another ER visit that resulted in a worsening response necessitating admission to the hospital. His care has been so fragmented and communication so compromised that he experienced in this circumstance, a doctor induced overdose. Looking back over the last several months, he has experienced intolerable amounts of pain and suffering – the likes of which no one should have to experience. While in the Hospital after his initial diagnosis of pneumonia, he fell and injured his back causing significant and persistent pain that was initially misdiagnosed as pleurisy. Months of pain and misdiagnoses left lingering unresolved pain. My mother likewise has an idiopathic issue that results in protracted and unimaginable pain. The poor women has experienced dumbfounded docs and care that resulted in multiple re-admissions and ultimately no resolution of the issue. We have traveled to distant cities to see experts with hopes that we can get her issue under control. An appointment just this week left even the Doctors at Cleveland Clinic shrugging their shoulders in ignorance. Idiopathic pain unresolvable by the best. This isn’t anyone’s particular fault, but it leaves my mother wondering when the next episode will incapacitate her with pain. That is no way to live. She now needs experts in pain management. My parents are strong, independent, self-reliant, humble and unassuming people who do not have a bone of entitlement in their make-up. They have worked hard throughout their lives as solid contributors to society. They are careful and cautious people trying to do what is right. What they have gone through in their golden years is tragic. And some of it, certainly not all of it, lies at the feet of modern health care. Now, we have cancer care on the immediate horizon. I cannot and will not tolerate the mediocrity that pervades the healthcare system in pursuit of my wife’s recovery. We will advocate for the best possible care available, and will not accept less than best practices should our insurance company attempt to compromise my wife’s care to save a buck. This will not be easy and perhaps not cheap, but life and time are precious. Far more precious than the material possessions that surround us. I keep saying that if Lance Armstrong can survive the extensive cancer he had and go on to win a record number Tours de France, than we can beat this. The only question is – will we get Tier 1 level of care? Clearly there are three tiers of healthcare in the United States. There is the reactive or non-existent care received by the poor and those at the lower end of the SES spectrum who cannot afford insurance. Then there is the care for those of us with health insurance – adequate for run of the mill ailments – but stressed by complexity. Then there is Tier 1 care for those with no financial restraints. Money talks and it can buy you the best care in the world. And so the journey begins. We have a lot to learn and a formidable opponent. Cancer can be tough too.